I think this is the number one problem faced by women who survive abuse. Society assists us in the silencing of ourselves; we live in a culture of The Good Woman and complaining -- no matter what the injustice -- just isn't something a nice girl does. This conditioning to worry about duties to others, how we appear to others, above our own needs is a major part of our lives as women -- it's what assists the abuser in the first place, and perpetuates the further abuses we'll face from authorities (police, courts, etc.) as well as family and friends. 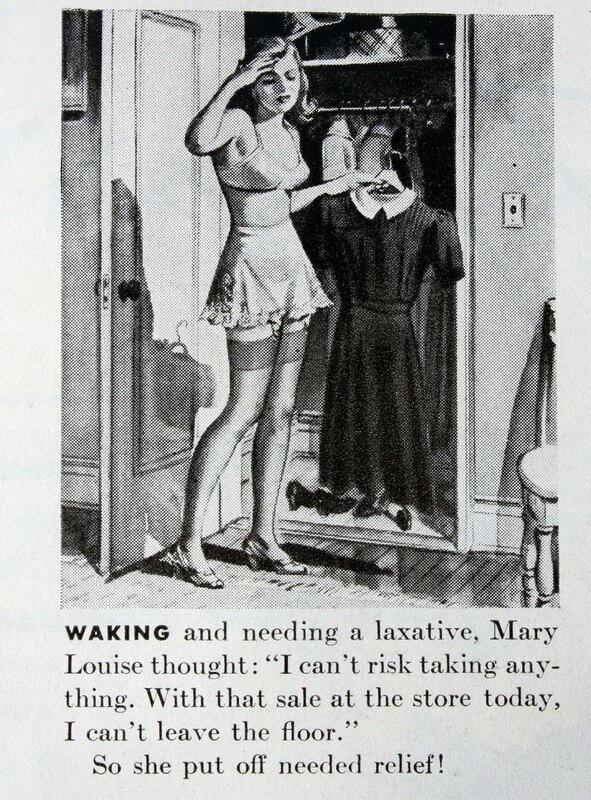 I think this vintage clipping captures our position of selflessness at our own expense. Her preservation of appearance and duty to work must come before her own comfort or even her health; like most things, it's funny because it's true. Women, especially survivors of violence and other abuses, need to speak up or risk suffering the consequences of emotional constipation. Image via Gordon Pym -- site is NWS. 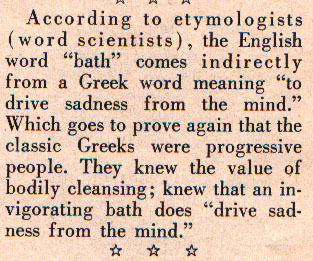 "To Drive Sadness From The Mind"
Most of us have seen this truth in our children; they get crabby or just a little off their sunny dispositions when they skip their baths. Why don't we realize that this is also true of adults? That other adage, about those who seem least likely to want a hug are most in need of it, is also true.